OkayFreedom is a VPN service from Steganos Software GmbH that provides VPN servers in four countries including the United States, United Kingdom, Germany and Switzerland. OkayFreedom VPN enable users securely surf all web content by protect their online identity and activities while using public WiFi. It also offers a virtual private network (VPN) to ensure anonymity and secureness of Internet connection. In addition, OkayFreedom VPN can override the IP address assigned to users by ISP with one drawn from its own pool of addresses that allow users to pretend to be connecting from a different location. Furthermore, OkayFreedom VPN recognizes whether content, videos and entire websites are restricted in users country and automatically directs users over a server which enables users to view the content. OkayFreedom VPN comes with three flavors: free, premium, and premium flat. 1GB data traffic per month is available for free account users, while 10GB per month for premium users, and unlimited traffic for premium flat. Enter your email address, and click “Abschicken” button. 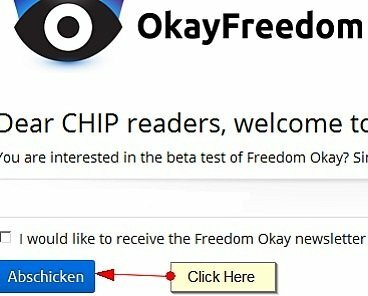 An email from OkayFreedom will be sent to registered email address containing the OkayFreedom premium code and download link. Install and run the software, and then click on “Redeem your premium code here” at top of the main interface and enter the code received.